So you want to work in Koyasan? First impressions made me wonder if I had made the right choice. My dealings with the management of the shukubo felt sometimes like a game of chicken. Like we were both seeing who would blink first, and cancel the deal. I certainly didn’t expect them to accept me as their employee, and I half believe they didn’t expect me ever to follow through and come. My room, at first glance, was like the attic from the Little Princess. 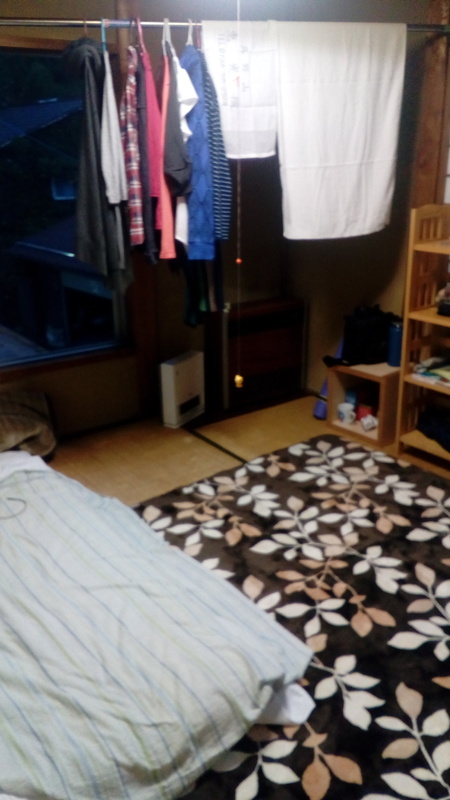 During the interview, the boss, Inge-san, had said the rooms were 6 mats. 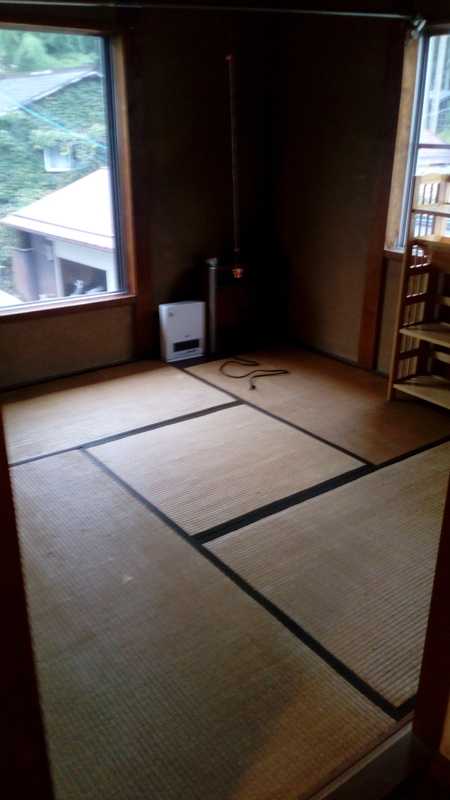 This was only 4.5, and the tatami by the windows were frayed. Inge-san’s mother, Okusan looked at it with concern. “We’ll get you a carpet.” She said. The previous occupant’s clothing was hanging up in a corner, and the cupboard still had her books and bits in it. “She quit after a month,” Okusan said. “Anything you want.” She said. Great, so despite asking what I would need, own work clothes including apron and bandana, and crocs were never mentioned. Even worse was that I actually owned all those things, but thought I would receive work gear. I went back to the car where my husband, was waiting and got in, shut the door and considered telling him we should just drive away. I mean, at that point it really was my point of last return. But then, I’d never feel like coming back to Koyasan again, and it would be the ultimate failure, giving up before even starting. For a moment though, it was tempting. Before shot of my room. So instead, I carried my bags in through the kitchen, and up the narrow stairs. I collected the carpet from Okusan and pulled little shelves out of the cupboard. As my gear started to find their places in the room, it started to look more like a little home, and a lot more welcoming than it had originally. It has two big windows, as it is on the corner of the building. One overlooks the cedar forest surrounding the town and a cluster of religious looking buildings within it. I prefer it to the other which fronts onto the street. After shot, with some more of me put in. I shared 3:30pm okashi (snack)-time with my new coworkers: Sen, Fuka, Hoku and Yuko. Hoku-san is 75 years old, tiny and quick to laugh. Most of my coworkers are tall, between 165 and 172 cm. Hoku must be, at most, 140, maybe 135 cms in height. She poured tea for us from a copper pot that seemed half as tall as she. Fuka is very self-composed, with a quiet manner. Her black hair short in a pixie cut. Her clothes are baggy but stylish, and suit her lanky style – long, knits over tights. Yuko too has soft, feminine features – her hair swept across her forehead elegantly beneath her work bandana. Her samue, work yukata, in a traditional style, folded across her body, and unpatterned in maroon, or black or blue. Sen is a ball of energy and chatter. When she talks her words often spiral upwards explosively, with hand gestures to match. It was her day off. “If you’re not too tired tonight, let’s go to a ceremony in the Okonoin” She suggested. I went back up to unpack, and made a list of things I would need to bring back at some point. Crocs, apron, bandanas, old clothes to work in… a pillow to replace the hard, bean filled ones, and… something to cover the doorway. Did I really have no door? I looked around the sliding space where a door should be, but couldn’t seem to find one. Some of these were soon scratched off, as Hoku came up and pressed a bandana into my hand. Later the Okusan came up to see how I was, and to lend me to her apron. “Actually, my room has no door.” I said to her. “Yes! There’s a door there. Definitely!” Came the reply. Turns out the bloody thing was hiding amognst the other sliding panels of my cupboards. I wondered how long I would have to live down not being able to find my own bedroom door. 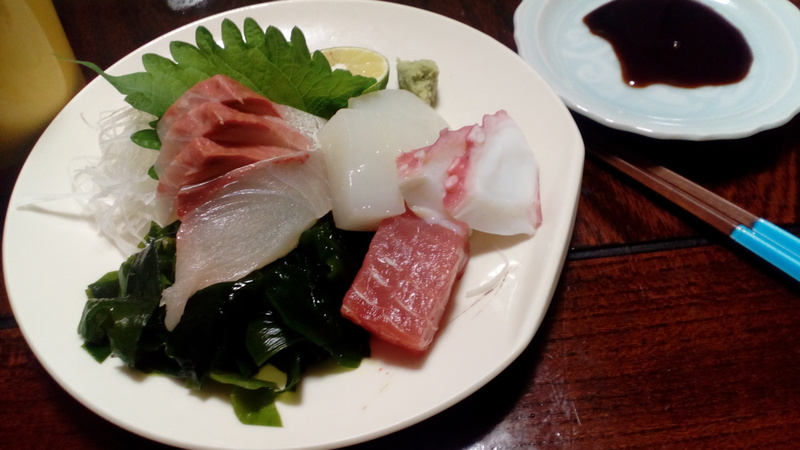 Dinner time and it was sashimi, with rice, and soup which Sen and Hoku ate, though Fuka had hamburger mince instead of fish, and Yuko a bowl of granola. Hoku brought out plastic platters of okazu, non-rice morsels, to share with us. Most of it is tsukemono, Japanese pickles. A bowl of yellow pickled daikon, Japanese radish, with sesame seeds; a plate of something red and slightly spicy, and natto, fermented soy beans. Natto not only looks unappetising, a chunky, brown goo that drools spidery filaments when scooped; and not only has a strong, if localised, smell, but even by audio standards, it is gross. The zarazara sound of chopsticks against the plastic as they stir in raw egg, and the slurping necessitated by its sloppiness. “Feli, do you want some?” Hoku offered. Hoku took charge of my plates that night, so Sen and I could rush to the see the ceremony. Our temple is built close to an ancient graveyard, called the Okuno-in. It is where Japanese notables for centuries have been buried. Everyone from Nobunaga, the warlord who dreamed of uniting Japan, to his betrayer are here. More recent tombs include ones for staff from Panasonic, the Japanese Space Agency, and one built by insect terminators to honour the deaths of the thousands of white ants killed each year. At night, it is a little bit spooky. Koya pines, of giant dimensions, crowd the stone path and the shadows hide the graves. Occasionally there is a squeak from as a flying squirrel somewhere above. “Do you have any interest in Buddhism?” She asked. I felt comforted by this. Sen is very bright and easy-going and has lived abroad in England for a year. She has a lot of patience, maybe understanding how difficult it can be immersed in a foreign language. “How is the job?” I asked her. “Yuko’s on a diet.” She explained, “The food was too delicious, and she got fat! Fuka maybe has some other reason…” She trailed off as we crossed the no-photography bridge into the most sacred part of Koyasan. On October 1st, 2nd and 3rd, in what is called TORODO (The Lantern Hall ) they hold a ceremony called MANDO-E. There were already a lot of people sitting on the tatami in the front rows. Sen handed me a coin and we clapped our hands together. “Please let this be a good experience. Please let everyone be nice. Please let me do well.” I tossed the coin into the offerings box. We took a standing spot just behind them. A girl with short, cropped hair, and a black yukata joined us. “Ah, Yama-chan!” Sen greeted her, as they both took out Buddhist rosary beads. “Are you very interested in Buddhism. ” I asked Yama-chan. “Oh yes. I’m actually a huge fan of Kobo-Daishi.” She enthused. According to legend, within a cave behind the lantern hall, lies the 1200-year-old, mummified remains of the man who spread Buddhism in Japan, and who settled Koyasan as a place of Buddhist learning. He is considered still living, and is fed twice a day by various temples. The monks entered. These were young monks making their debut, Sen whispered to me. They came through in a line, stopping at the boards so that temple workers could help them put on oversized, black and rounded, ceremonial clogs. A giant pair was reserved for an elderly, obviously high-rank monk. I found myself feeling sorry for him. Movement was obviously difficult enough for him without the shoes, and then he had to climb atop an elevated, cushioned chair. There was a pregnant pause as he did so, and younger monks clustered to arrange his volumous, orange robes. Spectators rushed in as the final monks passed between the short, wooden barriers, snapping photos on their phones, as temple workers crossed their arms in a warning “no” signal. Meanwhile, in the seated around, another of Kobo-Daishi’s “big fans” had crept forward to an altar at the very front of the gathering, taken a pinch of incense, and made an offering. Others, noticing this, had begun making their way to the altar, sitting in the seiza position as they waited their turn. Sen had her rosary beads out and started chanting along with the monks. After about 10 minutes, I was bored and annoyed with myself for being so. I love Koyasan, and I love Japanese culture, but perhaps, after 10 years, I had seen enough ceremonies not to be easily transported by a group of adult men in fancy robes chanting the same phrase over and over. They all had beautiful voices, and I caught myself wondering if they had been chosen for that reason. Other weird thoughts would cross my mind, as tried surreptitiously to stretch my cramping muscles. I studied the faces of the monks and wondered if any of them regretted their choice in being here. I looked at the increasing lines of petitioners at the altar behind them and wondered if religion was some in-joke that most of us never got to share. I think, I was very tired that night. Despite not wanting to make a weak impression to my new senpai, I gave in after 30 minutes and indicated I was leaving. Sen followed. “It’s too long right?” She said as a Japanese couple walked past us, echoing the same thought. “Tomorrow, 6:30 we start, but as it’s rubbish day, can you maybe come out a little bit earlier?” She asked. This is awesome that you’ve started a blog about this. I was really hoping you would. I think it’s cool that you’re living up at Koyasan. I look forward to more of your updates. Hey, thank you for reading it! I’m blogging through my usual Where Next Japan page, so I didn’t have to start a new one 🙂 BTW, I have all my permissions for filming in the temple sorted, so hopefully the video will be up soon on my Youtube channel too! In answer to your question/title. No. Sounds like an experience to behold. Looking forward to reading more. Love the room and the door ;-). Happens to all of us one way or another. Enjoy my friend.